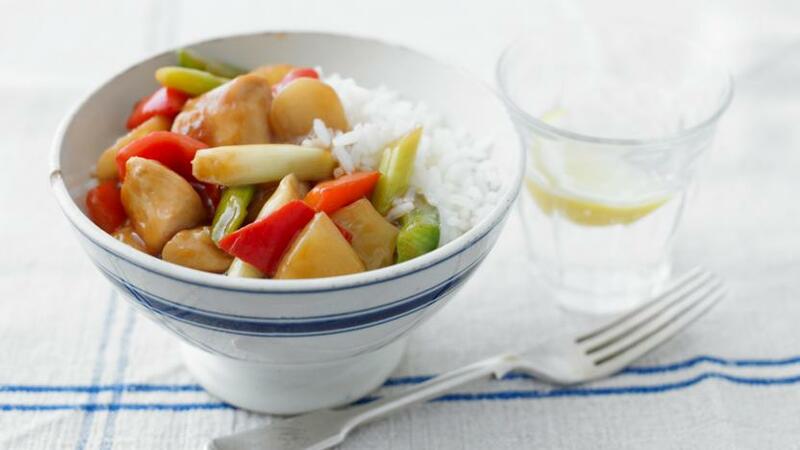 You'll be able to whip this sweet and sour chicken recipe up in less time than it takes to phone for a takeaway. And it's healthier, too! Heat the oil in a wok or large frying pan. Add the chicken, peppers, ginger and garlic. Fry for 2-3 minutes, then add the water chestnuts, spring onions and pineapple, if using, and fry for about 30 seconds. Add all the sauce ingredients and bring to the boil. Reduce the heat and simmer for about 6 minutes. Season with white pepper.